Since 1887, when the first Boos block was constructed to absorb the blow of a blacksmith's hammer, John Boos and Co. has crafted butcher bocks and cutting boards of unparalleled quality. For over 125 years, John Boos has perfected the construction of end and edge blocks and boards in their wood plant in Effingham, Illinois. From start to finish, 15 craftspeople work on building and finishing a John Boos board. This attention to detail has made the name John Boos name synonymous with quality and durability. 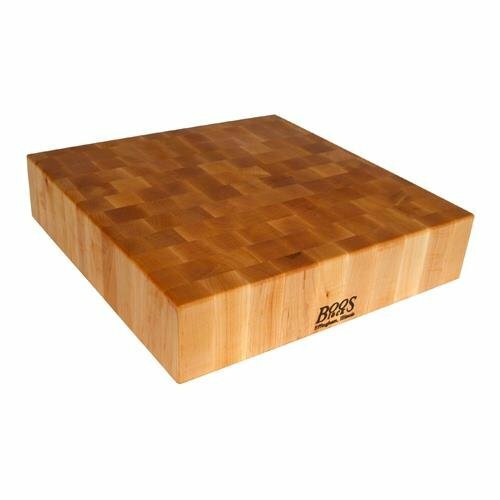 Boos boards and blocks are a favorite of professional chefs and can be found in commercial kitchens, restaurants and homes alike. The BB block is the granddaddy of all John Boos chopping blocks. Its beauty lies in its end grain construction: an expertly handcrafted process results in "checkerboard" wood grain pattern. Don't be fooled by its good looks- this block is a true workhorse in the kitchen. Measuring an impressive 6 inches thick, this block is designed to handle serious food preparation: cleaving, cutting, slicing and carving. Proudly made in the USA of hard rock maple. The BB block is reversible for dual cutting surfaces. To care for this block, oil regularly with John Boos Mystery Oil (sold separately).